Yesterday (March 21, 2013), along with 14 other religious folk, clergy and committed “laity,” I was arrested for standing at the White House with signs and songs, reciting the names of more than one hundred people who had been killed by one result of the climate crisis – Superstorm Sandy. We were calling on the President to act swiftly to heal our Mother Earth from the climate crisis, from the plagues that modern Pharaohs - Big Oil, Big Coal, Unnatural Gas -– have brought upon us. Earlier, in a circle of 70 people in the midst of Pennsylvania Avenue , we had just completed a religious service. Rabbi David Shneyer had blown the shofar of warning and liberation; we had heard the Muslim call to prayer from the Quran, an invocation of the Four Winds in the spiritual tradition of the First Nations, and a Christian prayer. Then I spoke about the Bitter Herb and recited the Ten Plagues of our own generation. In a traditional Passover Seder, we would pour wine from our cups ten times in order to express our grief over the ancient Ten Plagues. In the same vein, I invited the gathered community to call out “Sorrow” ten times as we absorbed the grief brought on by the modern plagues. We shared some matzah that I passed around the circle —the Bread of Affliction that on the night of Exodus became the Bread of Freedom because it was baked in haste and urgency. Just so, I said must we move with what Dr. King called “the fierce urgency of Now,” to heal our planet before its wounds overcome us. After the Matzah, Rose Berger of Sojourners magazine shared Palm branches around the circle and with them, the meaning of Palm Sunday – commemorating Jesus’ entry in a protest march into Jerusalem, opposing the violent and deadly Roman Empire just before Passover – the appropriate and risky time of remembering the downfall of Imperial Pharaoh. 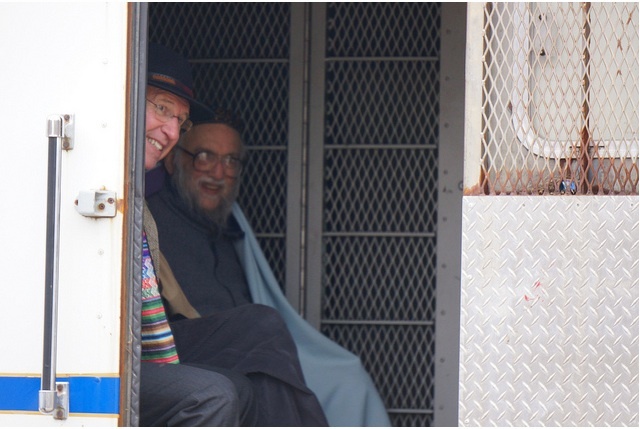 As you see on the faces of two of us actually in the prison wagon after our arrests, the arrest itself – paradoxically – felt like a step into freedom, a continuation of, rather than a break from, both our joy in singing and our sorrow at the deaths we had recited. What is the Freedom of Passover? – Freedom to grieve our wounds, Freedom to celebrate our covenant for action with YyyyHhhhWwwwHhhh, the Holy One Who is the Interbreathing of all life . Feel free to use it either as a whole this coming week – or choosing passages from it to add to your own Seder. And if you feel moved to support this work we are doing, please make a (tax-deductible) donation to The Shalom Center by clicking on the “Donate” banner on the left margin of the page. This action, organized by the Interfaith Moral Action on Climate (IMAC) and strongly supported by The Shalom Center, made clear to President Obama that his inspired pledge to halt the destruction of the Earth from climate change requires that he take bold and courageous actions, including rejecting the Keystone XL tar sands pipeline. Our March 21st action took place at a critical moment: Many of our religious communities will be preparing for Passover and Holy Week. (Palm Sunday begins Holy Week on March 24; the first night of Passover is on Monday, March 25), even as our President faces a profound decision that will affect our planet – teetering on the edge of a climate tipping point – and the human communities throughout the Earth already suffering the effects of the climate crisis and threatened with more and worsening disasters. Super-storm Sandy, the drastic droughts in our corn country, record-breaking Arctic ice melt, disasters in Australia, Russia, Pakistan and Africa, and the realization that 2012 was the hottest year on record in the continental US, all warn us: the disruption of our planet will not wait for our “normal” political paralysis to end. If we go over the Climate Cliff now, experiencing Plagues in our own generation as the Bible describes the Ten Plagues –- all eco-disasters — long ago, our grandchildren will live in misery and suffering. Today’s Plagues endanger the web of life upon our planet, including the human race – and inflict the greatest harm on the poorest and most vulnerable among us. We are especially concerned by the effects on local communities and our planetary future of destructive, extreme energy extraction: mountaintop removal, fracking, Arctic and deep sea offshore oil drilling, and Tar Sands mining. Out of our moral commitment to protect and heal God’s Creation, our religious communities need to be calling for a set of first-step changes that will sow the seeds of greater change, by committing the President and Congress to vigorous action. As we do civil disobedience at the White House, we address not only our government, but also religious communities throughout the country: In the name of Creator Spirit, Holy One of Being — JOIN US! 1. Permanently refuse permits for the Keystone XL tar sands pipeline, because tar-oil is among the most dangerous of the planet-heating forms of carbon. 2. Call now a National Summit Conference on the Climate Crisis to meet with the urgency that the crisis demands — including leaders of business, labor, academia, religious communities, governmental officialdom, science, and other relevant bodies. In the Name of the God whose Names are many, we invite and urge you to join us on March 21st at the White House. To endorse this action or indicate your intention to take part, please contact Cindy Harris at cynthiaharris4930@gmail.com. *Asoka Bandarage, author, Sustainability and Well-Being: The Middle Path to Environment, Society and the Economy (Palgrave MacMillan, forthcoming).